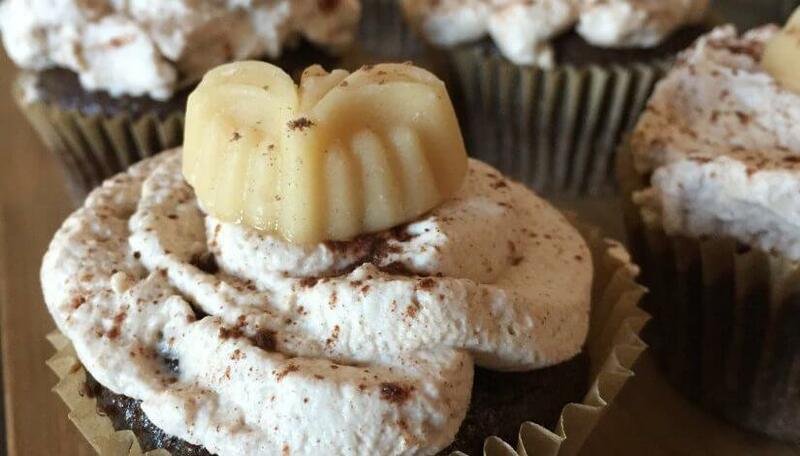 Chocolate fans rejoice: Wednesday, October 18 was National Chocolate Cupcake Day! Aren’t holiday’s great? 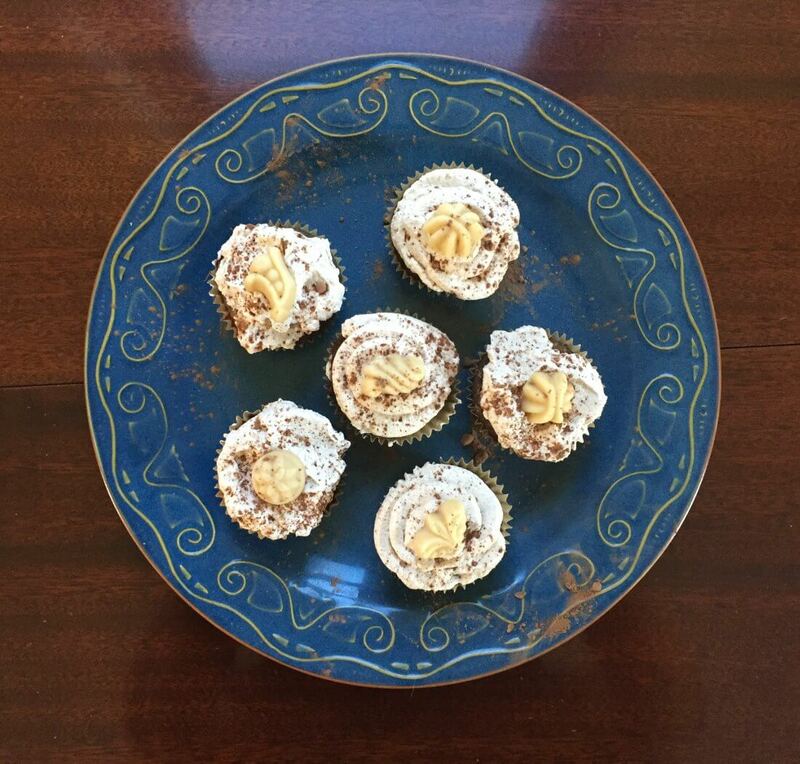 The occasion gave employee Alex the inspiration she needed to try a chocolate cupcake recipe featuring maple syrup for Recipe of the Week. The result was certainly worth the effort. See how it went below, and check out the recipe card at the bottom of the page. I’m back again for another maple recipe. This time, thanks to an awesome and under-celebrated holiday, to make cupcakes! Who doesn’t love cupcakes? This one is going to be a bit of a double whammy because I couldn’t very well make cupcakes without making frosting. I’m not a baker generally, so I was pleased to find that this one turned out okay. Then again, how could I really go wrong? I hope this gives you a bit of the National Chocolate Cupcake Day spirit and you decide to try it on your own. Don’t be scared! If I could manage it, so can you. If you don’t already have most of these ingredients in your kitchen, brace yourselves. I think this would have been a full shopping trip if I didn’t already have most of it myself. As usual, I chose local and organic over “conventional” wherever possible. Shout out to Organic Valley and Watkins who are both headquartered in the Driftless region. Lets get started! There is a little bit of thinking ahead needed for this one. First off, you should warm your butter to room temperature. I set mine out hours before I started this recipe. However, it was frozen. I don’t think it was quite warm enough when I made my cupcakes. Be sure it is nice and soft before you get started. 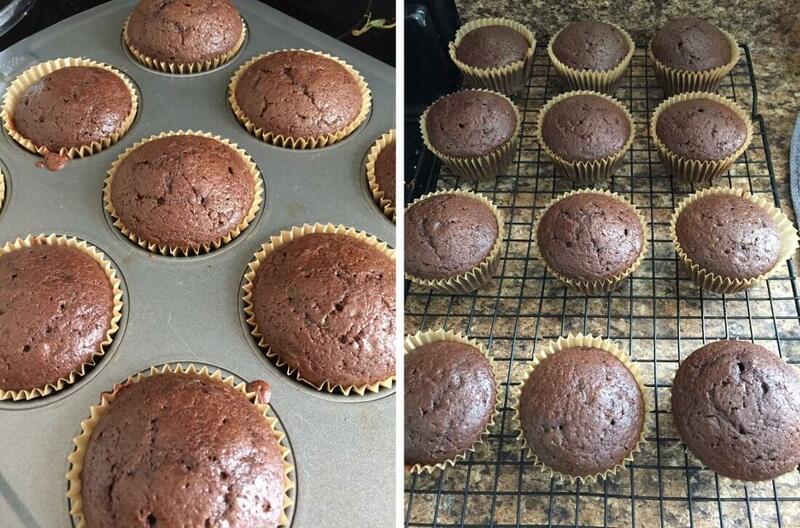 If you are using a cupcake tin without baking cups, this would be a good time to grease the pan as well. I chose to use baking cups for ease of cleanup. You will also want to preheat your oven. If it is slow to get going, make sure you give it enough time. I started by mixing my butter in a mixer at a low/medium speed for a few seconds. While it was mixing, I added in the eggs. Once they were well combined, I added the rest of my ingredients one by one, mixing continuously the whole time. Because my butter was not quite warm enough when I started, it did get clumpy. I was worried it might ruin my cupcakes, but it didn’t seem to have any affect on the final product. 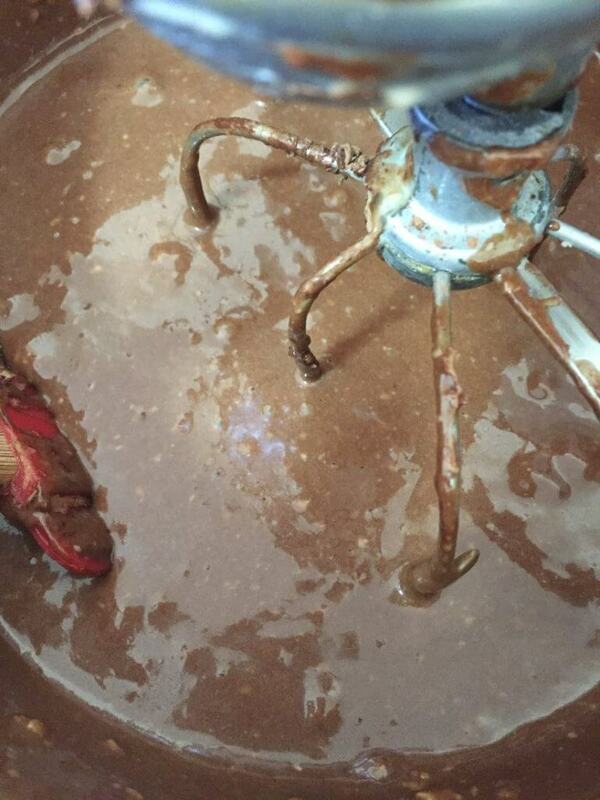 You can speed up your mixer slowly as you go, just don’t do it too quickly or things get messy fast (oops). 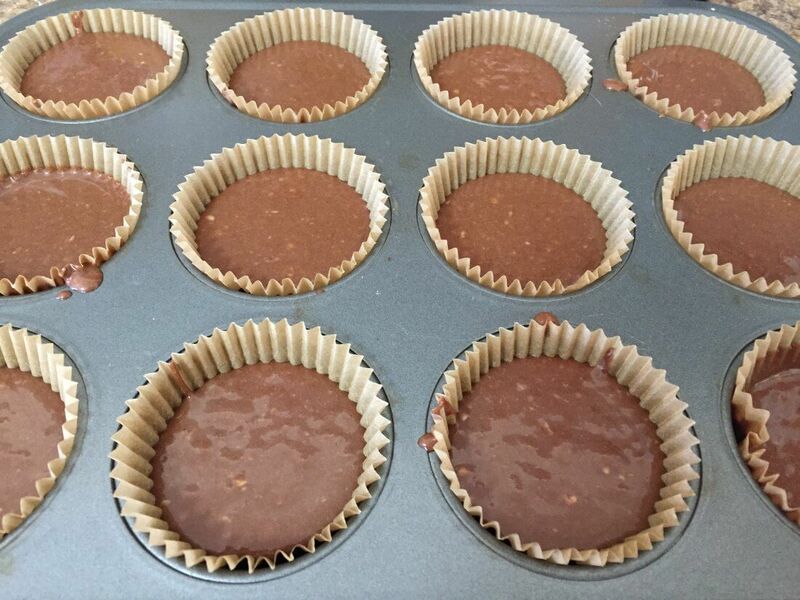 Once your batter is ready you can add it to your pre-greased or lined cupcake pan. Try to fill each cup to somewhere between 1/2 and 3/4 full. If you mess up, like I did, and add too much, you can spoon some in to another cup. Bake them in your 350 degree oven for 20 minutes. When the 20 minutes is up, test your cupcakes by poking a toothpick in to the center of one and checking to see that it comes out clean. If it does, you can transfer them to a cooling rack if you have them in liners, or just cool them in the tin if you don’t. Once they are fully cooled, you can remove them from the tin. I wanted a very simple frosting recipe that also featured maple syrup. Though Buttercream would have been the typical choice, I am not a big fan of it. I decided to go with a whipped cream frosting instead. This Cinnamon Maple Whipped Cream recipe from Beyond Frosting was just the ticket. 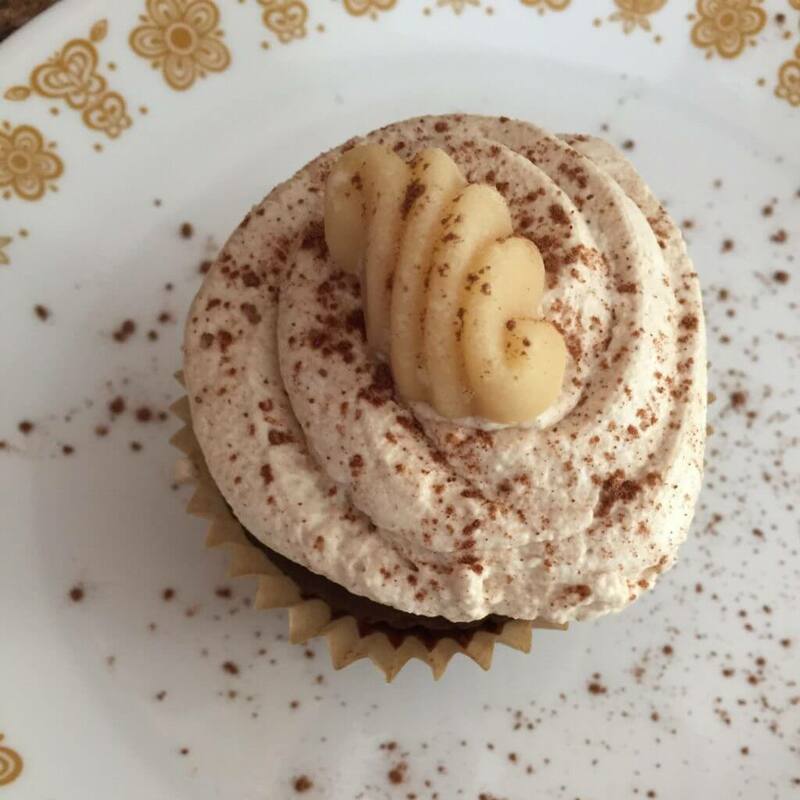 I appreciated the simplicity of the recipe and I thought the cinnamon would be a good compliment for the chocolate in my cupcakes. 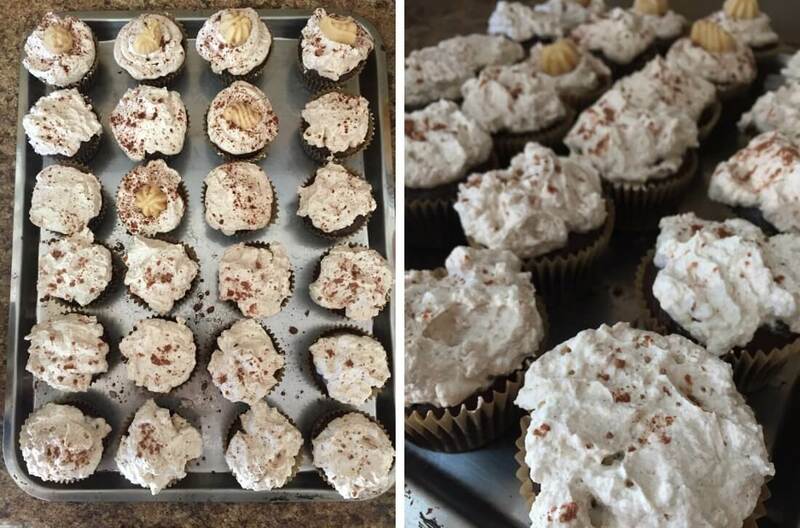 A note of warning if you decide to go this route – using a whipped cream topping on cupcakes is great if you plan to serve them right away. However, if you want to keep them for a while, I would suggest using a more traditional buttercream frosting. Unfortunately, whipped cream topping does not keep well and ends up looking flat and sad after some time. Having washed my mixer I was ready to give this one a try. I whisked the cream with the mixer on medium speed, slowly increasing speed as a went so as to avoid excess splash. Once there were stiff peaks, it was time to add maple syrup and cinnamon. As instructed, I added the maple syrup one tablespoon at a time and completely mixed it in before adding the next. Once it was incorporated, I added the cinnamon and gently folded it in a little with a spatula before turning on the mixer again for a few seconds. Be sure you don’t take to long doing this part of the recipe. Though mine still tasted good, I think that I may have over-mixed it slightly and lost some of the fluffy texture that was desired. My topping was ready and I decided to try adding it to my cupcakes by using a plastic bag as a sort of piping bag. It didn’t work very well. I should have read Beyond Frosting’s How to Decorate the Perfect Cupcake Tutorial apparently. I switched to adding the topping with a spatula and trying to smooth it. That didn’t work well either. I finally decided to embrace the madness and went with a helter-skelter approach. The taste is the most important part anyway, right? I sprinkled some cocoa powder on top to help hide my mistakes. I ended up with 24 cupcakes in total. 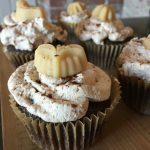 If you want to be a little extra fancy, you can try topping your cupcakes with maple candy for a little more sweet maple goodness. I tried this with a few of mine. The flavor was amazing! The cupcakes were not dry at all. With the whipped topping, they reminded me a little bit of lava cake. Everyone who had one was impressed with the moistness of the cake. I think this can be attributed to the use of maple syrup in place of dry sugar. They may not be the prettiest cupcakes I have ever made, but they were definitely the tastiest. Happy National Chocolate Cupcake Day friends! Did you try this recipe out at home? Let us know how it went in the comments below! In celebration of National Chocolate Cupcake Day! Before starting recipe, warm butter to room temperature. Grease cupcake pan if not using liners. Beat butter & eggs together in a mixer on medium speed. 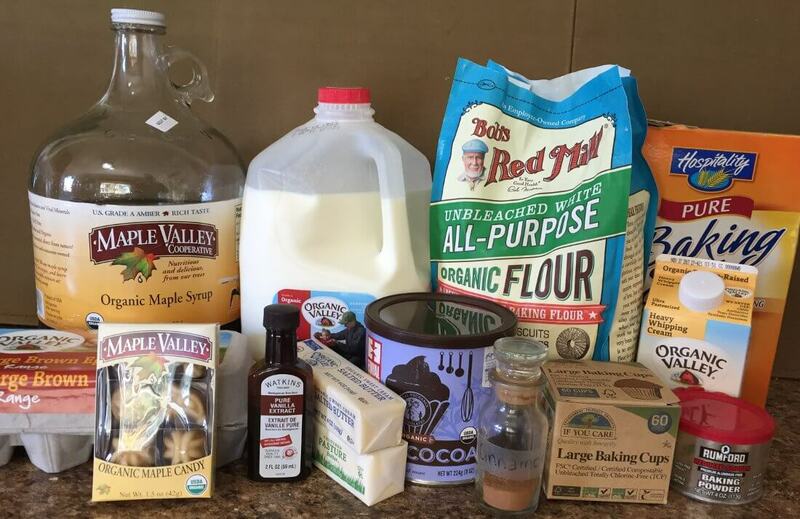 Add maple syrup, flour, milk, cocoa powder, vanilla, baking soda, salt, & baking powder. Mix until smooth. Pour batter into cupcake pan. Fill each cup to around 3/4 full. Bake for 20 minutes or until a toothpick comes out clean after being stuck into the middle of a cupcake. Cool completely. Once fully cooled, remove cupcakes from pan. Add frosting if desired & serve. Can be topped with a Maple Valley maple candy for extra flair.